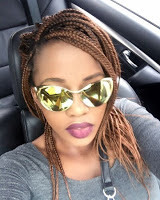 Kenya’s controversial and scandalous socialite Corazon Kwamboka who is ‘popular’ for having a well-endowed ‘German Juice’ is known for flaunting her voluptuous curves everywhere she goes but this time it was different. When you go to Rome, they say, do what the Romans do and Corazon Kwamboka literary adhered to the wise words of the sages. 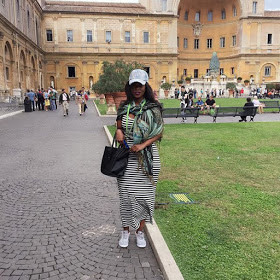 When she visits Miami, London, Dubai etc, she always shows more than enough skin to the public but things turned out to be different when she landed at the holy city of Vatican. She was dressed in a long, black and white stripped dress which made her look totally different. We are used to seeing her in skimpy and scanty dresses but this time she took us by storm.